· LegalXML Electronic Court Filing 3.0. Edited by Roger Winters. 15 November 2005. · Electronic Court Filing Version 4.0. Edited by Adam Angione and Roger Winters. Latest version: http://docs.oasis-open.org/legalxml-courtfiling/specs/ecf/v4.0/ecf-v4.0-spec/ecf-v4.0-spec.html. · Electronic Court Filing Version 4.01. Edited by Adam Angione and James Cabral. Latest version: http://docs.oasis-open.org/legalxml-courtfiling/specs/ecf/v4.01/ecf-v4.01-spec/ecf-v4.01-spec.html. · National Information Exchange Model 4.1. https://release.niem.gov/niem/4.1/. Electronic Court Filing Version 5.0 (ECF v5.0) consists of a set of non-proprietary XML and Web services specifications developed to promote interoperability among electronic court filing vendors and systems. ECF v5.0 is a major release that adds new functionality and capabilities beyond the scope of the ECF 4.0 and 4.01 specifications that it supersedes. Electronic Court Filing Version 5.0. Edited by James Cabral, Gary Graham, and Philip Baughman. 12 February 2019. OASIS Committee Specification Draft 04 / Public Review Draft 04. https://docs.oasis-open.org/legalxml-courtfiling/ecf/v5.0/csprd04/ecf-v5.0-csprd04.html. Latest version: https://docs.oasis-open.org/legalxml-courtfiling/ecf/v5.0/ecf-v5.0.html. This document is a specification developed by the OASIS LegalXML Electronic Court Filing Technical Committee. It defines a technical architecture and a set of components, operations and message structures for an electronic court filing system, and sets forth rules governing its implementation. · Core Specification – This core specification defines the Major Design Elements (MDEs) and the operations and messages that are exchanged between MDEs. · Service Interaction Profiles – Service interaction profiles are specifications that describe communication infrastructures that deliver messages between MDEs. · Document Signature Profiles – Document signature profiles are specifications that describe mechanisms for signing electronic documents. In order to be conformant, an implementation of the ECF specification MUST implement the core specification and at least one service interaction profile and one document signature profile. The MDEs and operations that make up the core specification are discussed in Service Model. The messages are defined in Messages. Service interaction profiles are discussed in Service Interaction Profiles. Document signature profiles are discussed in Document Signature Profiles. This Committee Specification Public Review Draft is provided under the RF on Limited Terms Mode of the OASIS IPR Policy, the mode chosen when the Technical Committee was established. For information on whether any patents have been disclosed that may be essential to implementing this specification, and any offers of patent licensing terms, please refer to the Intellectual Property Rights section of the TC’s web page (https://www.oasis-open.org/committees/legalxml-courtfiling/ipr.php). This section defines key terms used in this specification. A condensed representation of a document intended to protect document integrity, calculated according to the FIPS 180-4 SHA 256 algorithm. A file representation of a document (e.g. PDF). A unique value assigned as a tracking identifier for a ‘Filing’ (e.g. an e-filing submission). The filing identifier is carried by messages that are involved in an e-filing transaction that begins with the submittal of a filing:ReviewFiling message, and culminates with the final NotifyFilingReviewComplete operation call for the original filing:ReviewFiling message. Upon receipt of the final reviewfilingcallback:NotifyFilingReviewCompleteMessage by the originating FilingAssembly MDE, all filing lead and connected documents in the original filing:ReviewFiling message will have been reviewed and dispositioned (e.g. accepted and docketed, or rejected, etc.) or the filing will have been cancelled. Even after the conclusion of the e-filing episode, the filing identifier continues to be useful for GetFilingStatus requests. A centralized Service MDE capable of receiving a single set of service notifications for all parties registered for electronic service in a case and transmitting the service notifications to the Service MDEs registered to each party in the case. See definition in Messages. A Message in ECF is comparable to a UML “Parameter” or “Class” with the “Type” stereotype. A unique value assigned to a message, either as a unique reference to the message, or as a correlation value to reference a prior message. A definition of the input message and synchronous response message associated with an operation. Each message is given a name and a type by the operation. The type is defined by a single one of the message structures defined in the ECF 5.0 specification. A litigant in a case. A party MAY be a person, organization or property (e.g. “in rem” property). An entity (person, organization or thing) that plays some role in the context of an e-filing submission. Participants include parties, attorneys, clerks, judicial officials, other entities receiving service, etc. The person or organization that tenders an ECF message to an operation hosted by a MDE. In the case of a filing, the submitter MAY or MAY NOT be the filing attorney or party. A unique value that identifies a set of messages which collectively belong to or relate to a single purpose, episode, or outcome. Filing Identifier is an example of a specific type of transaction identifier. A transaction identifier MAY also be used to relate messages collectively involved in the ‘Scheduling Process’, such as requestdaterequest:RequestCourtDateRequestMessage, requestdateresponse:RequestDateResponseMessage, reservedate:ReserveCourtDateMessage, datecallback:NotifyCourtDateMessage, and allocatedate:AllocateCourtDateMessage. This section defines key symbols and abbreviations used in this specification. Media Types, 1 May 2017, Internet Assigned Numbers Authority (IANA), http://www.iana.org/assignments/media-types/media-types.xhtml. National Information Exchange Model 4.1, 2018, NIEM Business Architecture Committee, http://niem.gov. NIEM Code Lists Specification 4.0, 7 November 2017, NIEM Technical Architecture Committee, https://reference.niem.gov/niem/specification/code-lists/4.0/niem-code-lists-4.0.html. NIEM Naming and Design Rules 4.0, 7 November 2017, NIEM Technical Architecture Committee, https://reference.niem.gov/niem/specification/naming-and-design-rules/4.0/niem-ndr-4.0.html. Freed, N. and N. Borenstein, “Multipurpose Internet Mail Extensions (MIME) Part Two: Media Types”, RFC 2046, DOI 10.17487/RFC2046, November 1996, http://www.rfc-editor.org/info/rfc2046. Bradner, S., “Key words for use in RFCs to Indicate Requirement Levels”, BCP 14, RFC 2119, DOI 10.17487/RFC2119, March 1997, http://www.rfc-editor.org/info/rfc2119. Leach, P., Mealling, M., and R. Salz, “A Universally Unique Identifier (UUID) URN Namespace”, RFC 4122, DOI 10.17487/RFC4122, July 2005, http://www.rfc-editor.org/info/rfc4122. [RFC5545] Desruisseaux, B., Ed., “Internet Calendaring and Scheduling Core Object Specification (iCalendar)”, RFC 5545, DOI 10.17487/RFC5545, September 2009, http://www.rfc-editor.org/info/rfc5545. [xCal] C. Daboo, M Douglass, S Lees xCal: The XML format for iCalendar, http://tools.ietf.org/html/draft-daboo-et-al-icalendar-in-xml-08, IETF Internet-Draft, April 2011. Extensible Markup Language (XML) 1.0 (Fifth Edition), T. Bray, J. Paoli, M. Sperberg-McQueen, E. Maler, F. Yergeau, Editors, W3C Recommendation, November 26, 2008, http://www.w3.org/TR/2008/REC-xml-20081126/. Latest version available at http://www.w3.org/TR/xml. XML Encryption Syntax and Processing Version 1.1, D. Eastlake, J. Reagle, F. Hirsch, T. Roessler, Editors, W3C Recommendation, April 11, 2013, http://www.w3.org/TR/2013/REC-xmlenc-core1-20130411/. Latest version available at http://www.w3.org/TR/xmlenc-core1/. XML Signature Syntax and Processing (Second Edition), D. Eastlake, J. Reagle, D. Solo, F. Hirsch, T. Roessler, Editors, W3C Recommendation, June 10, 2008, http://www.w3.org/TR/2008/REC-xmldsig-core-20080610/. Latest version available at http://www.w3.org/TR/xmldsig-core/. Namespaces in XML 1.0 (Third Edition), T. Bray, D. Hollander, A. Layman, R. Tobin, H. Thompson, Editors, W3C Recommendation, December 8, 2009, http://www.w3.org/TR/2009/REC-xml-names-20091208/. Latest version available at http://www.w3.org/TR/xml-names. XML Schema Part 1: Structures Second Edition, H. Thompson, D. Beech, M. Maloney, N. Mendelsohn, Editors, W3C Recommendation, October 28, 2004, http://www.w3.org/TR/2004/REC-xmlschema-1-20041028/. Latest version available at http://www.w3.org/TR/xmlschema-1/. XML Schema Part 2: Datatypes Second Edition, Paul V. Biron, A. Malhotra, Editors, W3C Recommendation, October 28, 2004, http://www.w3.org/TR/2004/REC-xmlschema-2-20041028/. Latest version available at http://www.w3.org/TR/xmlschema-2/. · Requests by filers to cancel filing prior to recording. · Transmission of data modified (e.g. corrected) in the clerk review operation in addition to the unmodified data originally provided by the filer. · Queries by filers for available court dates. · Requests to schedule a court hearing. · Messages to notify parties of a scheduled court date. · Transmission of copies of documents submitted for filing to process servers and registered agents. · Transmission of copies of or links to documents submitted for filing to any party in a new case or any newly added parties in an existing case, except in the electronic delivery of documents to a registered agent. 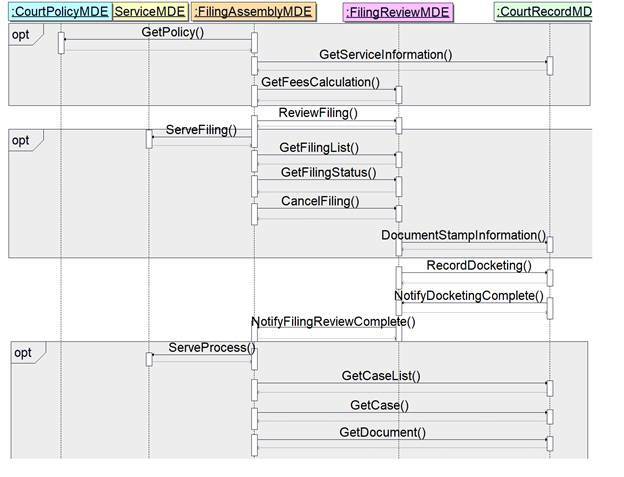 Although ECF 5.0 does not define data structure elements specific to other case types (e.g., administrative tribunals), the basic structure will support other types of court filings and is extensible through court-specific and case-type-specific extensions. Electronic Court Filing 5.0 supersedes the LegalXML Electronic Court Filing 3.0, 3.01, 3.1, 4.0 and 4.01 specifications developed by the predecessor organizations to the OASIS Electronic Court Filing Technical Committee. Those specifications were prepared for and approved by the COSCA/NACM Joint Technology Committee as proposed standards. · Conformance with the [NIEM Code Lists] specification version 1.0 and the representation of all ECF code lists in [Genericode] format. · Conformance with the 2.2 version of the Universal Business Language ([UBL]). · Better management of extensions through [NIEM] augmentations. · Deprecated content references (e.g. referring to related entities with common identifiers) in favor of element references (e.g. referring to related elements with structures:ref attributes) as described in Reference Rules. This specification does not assume that prior specifications will be deprecated. However, ECF 5.0 is not backward-compatible and applications using the ECF 3.0, 3.01 and 3.1, 4.0 and 4.01 specifications will not interoperate successfully with applications using these specifications. This fact is indicated by the assignment of a new major version number to the ECF 5.0 specifications. The ECF specification incorporates other existing, non-proprietary XML specifications wherever possible. In particular, the specification has dependencies on the [NIEM], the [UBL] data library and the World Wide Web Consortium (W3C) XML Digital Signature ([XML-DSIG-CORE] specifications. The terminology used in this specification to describe the components of the ECF technical architecture conforms to the OASIS Reference Model for Service Oriented Architecture ([SOA-RA]). It is suggested that implementations cache external schemas locally to improve performance and reliability. [NIEM] conformance, as defined by the NIEM Conformance Guidelines ([NIEM Conformance]), is a core objective of this specification. The [NIEM] is a framework that enables efficient cross-domain information exchanges, providing law enforcement, public safety agencies, prosecutors, public defenders and the judicial branch with a tool to effectively share data and information in a timely manner. The [NIEM] provides a library of reusable components that can be combined to automate justice information exchanges. The [NIEM] removes the burden from agencies to independently create exchange standards. Because of its extensibility, there is more flexibility to deal with unique agency requirements and changes. Through the use of a common vocabulary that is understood system to system, [NIEM] enables access from multiple sources and reuse in multiple applications. The use of [NIEM] element names does not require any change in local legal terminology. XML tag names are invisible to the user of an application employing them. The [NIEM] is most useful for describing common objects such as persons and locations, and criminal justice-specific processes such as arrest, booking, jail and prosecution. The [NIEM] is not as well developed for describing non-criminal information exchanges and processes. ECF 5.0 uses the [NIEM] version 4.1 where the structures and definitions correspond to the requirements of ECF 5.0. The development process, including the [NIEM] modeling process, is described in Development Approach And Artifacts. [UBL] is an OASIS Standard that provides a single ubiquitous language for business communication, and takes into account the requirements common to all enterprises. [UBL] provides a shared library of reusable components, essential to interoperability that can be combined to create electronic business schemas. Without a common set of base components, each document format would risk redefining addresses, locations and other basic information in incompatible ways. ECF 5.0 messages reference the cac:Address, cac:AllowanceCharge and cac:Payment [UBL] elements to describe filing charges and payments, respectively. The W3C XML Signature Syntax and Processing ([XMLSIG]) specification describes a mechanism for signing electronic documents. This mechanism allows recipients of electronic documents to identify the sender and be assured of the validity of the electronically transmitted data. [XMLSIG] defines standard means for specifying information content that is to be digitally signed. ECF 5.0 employs the [XMLSIG] specification to describe digital signatures applied to the entire ECF 5.0 message transmission in order to provide authentication, encryption and message integrity. [XMLSIG] is also used in the ECF 3.0 XML Document Signature Profile. The [SOA-RM] is a framework for understanding significant entities, and the relationships between those entities, within a service-oriented architecture. ECF 5.0 describes such an architecture and includes terminology that conforms to the [SOA-RM]. The OASIS Code List Representation format, [Genericode], is a model and XML schema that can be used to encode a broad range of code list information. The XML format is designed to support interchange or distribution of machine-readable code list information between systems. All ECF 5.0 code lists that are not defined in the NIEM are provided in [Genericode] 1.0 format and conform with the [NIEM Codelist] specification. This section describes the ECF 5.0 service model including six Major Design Elements (MDEs), two process models, and 21 operations. · Filing Assembly MDE – enables a filer to create a filing message for submission to a court, and for service on other parties in the case, returning a response from the court to the filer. · Filing Review MDE – enables a court to receive, validate, and review a filing message and prepare the contents for recording in its case management and document management systems, sending a response concerning the filing to the Filing Assembly MDE. · Court Record MDE – enables a court to record electronic documents and docket entries in its case management and document management systems and returns the results to the Filing Review MDE. The Court Record MDE also enables filers to obtain service information for all parties in a case, to obtain information about cases maintained in the court’s docket, register of actions and calendars, and to access documents maintained in the court’s electronic records. · Court Policy MDE – enables filers to obtain court-specific policies regarding electronic filing and to check on the status of a filing. · Court Scheduling MDE – an OPTIONAL MDE that enables filers to access court schedules and request a date for a court hearing. · Service MDE – an OPTIONAL MDE that enables a party to receive service electronically FROM other parties in the case. Note that service TO other parties in the case is performed by the Filing Assembly MDE. The MDEs defined in the ECF 5.0 specifications are meant only to define the “interface” to each operation; the specification is not intended to define how operations must be implemented. This strategy allows MDE implementations to interoperate while leaving room for vendors and courts to have differing implementations (e.g., an implementation that supports a particular CMS). An ECF 5.0-conformant implementation MAY implement one or more of the MDEs defined in the specification but a complete ECF 5.0 system MUST include at least one each of the Filing Assembly, Filing Review and Court Record MDEs. For instance, a court MAY decide to provide certain MDEs and allow private providers to furnish the remaining MDEs. When multiple MDEs are implemented by a single court, vendor or application, the application MUST maintain the ECF 5.0 specified operations between each MDE so that other applications will be able to interoperate with it. Each of the operations supported by an MDE accepts one or more messages as input and typically returns an immediate, synchronous response message to the calling MDE. For some operations, the MDE will also return an asynchronous (callback) message at a later time that reports the result of a business process implemented within the MDE. In order to be conformant with ECF 5.0, an MDE must support all messages required for that MDE. However, in an ECF 5.0 system that does not support electronic service, the operations associated with the Service MDE are not required. Multiple systems MAY implement the same operation within a given MDE whereby one system “passes through” the request to another system. A likely use case for this is a hub/spoke topology where one system is serving as a hub through which multiple FilingAssemblyMDE providers are accessing multiple CourtRecordMDE providers. In such a scenario, the FilingAssemblyMDE system would invoke the CourtRecordMDE on the hub system, which would then “pass through” the request by invoking the CourtRecordMDE on the appropriate court system. The hub would then “pass through” the response from the court system to the system that made the original request.An MDE defines an information model and behavior model of a service as described in the [SOA-RM]. Note that “service” in the service oriented architecture sense is not the same as the business function of “service of filing” used throughout in this document. This section details the sequence of operations and the role of each MDE in the electronic filing and service process and the scheduling process. · a Service Recipient (represented by the Service MDE). These operations are depicted in the sequence diagram below. The solid lines indicate invoked operations and the dashed lines indicate the synchronous responses to those operations. The lines representing each operation originate from the MDE consuming the operation and terminate the MDE providing that operation. The information model describes the data content exchanged between MDEs in each operation as a set of XML messages, case type [NIEM] augmentations, XML schema and [Genericode] code lists and binary attachments. The following table lists each ECF 5.0 operation, the MDEs that MUST provide and MUST consume the operation if the operation is either required or OPTIONAL and enabled by Court Policy, and the input and output XML messages that define the data content exchanged. Other MDEs MAY also consume the operation. The XML schemas in the schemas folder provided with this specification are the only normative representations of ECF 5.0 messages and case type augmentations. Elements and types that are common to multiple ECF 5.0 messages and/or case types augmentations are provided in the ecf.xsd schema. The content of ECF messages are intended to be useful to an automated case management system for the purposes of partially or fully automating case workflow after filing (e.g., filing review, noticing, docketing, judicial assignment, calendaring, standardized forms receipt and generation, fee processing) or ascertaining the adequacy or appropriateness of the filing (e.g., fee or fine calculation, jurisdiction). ECF 5.0 messages are not intended to fully populate the automated case management system with all data contained within filed documents. That is, these messages should be useful as “filing metadata” about the case, the filing transaction, parties or documents. All “filing data” elements should be described in the filed documents, whose structure is outside the scope of the ECF specification. · Filing metadata including identifiers for the sender and receiver, the sending and receiving MDEs, and the submission date and time. · Information about the court case, including identifiers for the court and case. · Optionally, one or more case type augmentations, as defined in Case Augmentations, that include information appropriate to a filing in a specific case type. · Optionally, one or more court-specific augmentations and/or code lists, as defined in Case Augmentations and Code Lists, that include information appropriate only for filings in a specific court. Court-specific augmentations and code lists are limited to a particular court or court system. · Circumstantially, information about one or more lead documents that will be placed on the court’s register of actions (docketed, indexed) as a result of the filing. A “document” in this sense is the electronic representation of what would be recognized as a “document” if it were a single, whole, physical paper object. The message includes the document metadata, for example, its title, type, identifier, parent document identifier and document sequence number. Each document structure MAY reference one or more attachments, including attachment identifiers and sequence numbers, as defined in Attachment Identifiers. · Optionally, one or more supporting document(s), which are present to supplement the lead document(s) in some way. The message includes the same document metadata for lead and supporting documents. Extensions to ECF messages are implemented using NIEM “augmentations”, as described in Section 10.4 of the [NIEM NDR]. An “augmentation element” based on an “augmentation type” (usually structures:AugmentationType) is used in place of (substitutes for) an abstract element called an “augmentation point” that are recognizable by an element name ending in “AugmentationPoint”. Multiple augmentations MAY substitute for the same augmentation point; however, each augmentation MUST not substitute more than once for the same augmentation point. The case type and category associated with a filing SHOULD be indicated with the ecf:CaseTypeCode and ecf:CaseCategoryCode elements. The inclusion or lack of a case type augmentation in a filing message SHOULD NOT be considered an indicator of the case type and category associated with that filing. Code Lists are used to constrain the allowable values for certain information in a message. Court-specific code lists are listed in Court-Specific Code Lists. The allowable values for the following XML elements are normative for all ECF 5.0 implementations and are defined in ECF [Genericode] code lists or NIEM or UBL XML schema. The binary content of an electronic document SHOULD be transmitted as one or more attachments. A document MAY be split into several attachments to satisfy a court requirement regarding maximum document size. Each attachment MUST include a content identifier unique to the specific message exchange and referenced in the message using a nc:BinaryURI element The assignment of content identifiers to attachments and the order of transmission of messages and attachments is defined in the service interaction profile. Alternatively, the binary content of the document MAY be base-64 encoded and embedded in the message using a nc:Base64BinaryObject element. However, the embedding of documents in XML messages is deprecated in ECF 5.0. Sample messages input and output message formats for both synchronous and asynchronous operations are provided in Message Formats. Errors MUST be reported with the cbrn:ErrorCodeText element. Successful request and response messages MUST return an cbrn:ErrorCodeText of “0”. Failed request and response messages MUST NOT return an cbrn:ErrorCodeText of “0” and SHOULD return an appropriate cbrn:ErrorCodeText value as defined in court policy and sufficient detail in cbrn:ErrorCodeDescriptionText to describe the error. Errors 0 to 99 are reserved for use by the ECF specification and MUST NOT be used for reporting implementation-specific errors. Any implementation-specific error codes MUST be no less than 100 and defined in a court-specific code list ErrorCodeText.gc. · Human-readable court policy – a textual document publishing the court’s rules and requirements for electronic filing. · Machine-readable court policy – an ECF 5.0 policyresponse:GetPolicyResponseMessage describes the features of the ECF 5.0 implementation supported by this specification, the court’s code lists and any other information a Filing Assembly MDE would need to know in order to successfully submit an electronic filing into that court. The court MUST have only one active, authoritative set of its human-readable and machine-readable court policies at a given time. The court’s human-readable and machine-readable court policies MUST each have a version number associated with it. Court policy is not directly equivalent to “service policy” in the [SOA-RM]. However, thinking about court policy from a policy assertion, policy owner and policy enforcement framework as described in the [SOA-RM] is helpful. Note that “court policy” refers to a set of constituent rules and requirements, while the [SOA-RM] looks at each individual item as a “service policy.” In all cases the policy owner is the court where the document is to be filed. None of the elements of court policy rise to the level of a “service contract” as defined by the [SOA-RM]. 7. A description of any restrictions to data property values other than code list restrictions. Machine-readable Court Policy includes structures for identifying run-time and development-time policy information. Run-time information includes information that will be updated from time to time, such as code lists (e.g., acceptable document types, codes for various criminal charges and civil causes of action) and the court’s public key for digital signatures and encryption. Also included are the general court schedule that includes operating days and judge schedules. 2. The case types that the court allows to be filed electronically. 7. Whether the court accepts multiple lead documents in a single filing. The machine readable court policy MUST be provided to the Filing Assembly MDE either by the Court Policy MDE through the GetCourtPolicy query or some other means. Any court-specific augmentations to ECF messages MUST be defined using augmentations, as described in Section 10.4 of the [NIEM NDR]. Court-specific augmentations MAY extend any of the following ECF or NIEM messages or augmentable elements by substituting a court-specific element for the associated augmentation point. For instance, a court MAY add elements required for a particular case type (e.g. civil) by defining an extension that includes an augmentation element (e.g., court:CivilCaseAugmentation) that substitute for an ECF augmentation point (e.g. nc:CaseAugmentationPoint). Court policy MUST include a policyresponse:DevelopmentPolicy/policyresponse:SchemaExtension element that references each court-specific augmentation. A unique version-independent identifier, the latest version and URL of all court-specific augmentations MUST be provided using the policyresponse:ExtensionCanonicalURI, policyresponse:ExtensionCanonicalVersionURI and policyreponse:ExtensionLocationURI elements, respectively. Courts SHOULD publish [Genericode] 1.0 code lists that define the allowable values in that court for each of the following XML elements in the following table. The specification provides non-normative [Genericode] code lists for each of the XML elements in the above table. The specification-provided code lists in the table above that are marked as “Yes” for “Default Values” have specification-provided values. For each XML element, a court MAY either use the specification-provided code list as its court-specific code list, or provide a court-provided [Genericode] code list for that element. The values of any court-provided code list SHOULD be a superset of the values in the corresponding specification-provided code list. The acceptable values for nc:BinaryFormatText, defined in the BinaryFormatText.gc code list whether court-provided or specification-provided, MUST conform with [IANA Media Types] but MAY not be a superset of the specification-provided code list. Court-specific versions of the IdentificationCategoryDescriptionText.gc code list MUST be a superset of the specification-provided code list. Implementations MUST define a court-specific code list of countries using LocationCountryName.gc. For any court-specific lists not itemized in court policy, then any value MUST be considered acceptable for the corresponding XML element. Similarly, if a court policy references a specification-provided or court-provided code list that does not include any values, then any value MUST be considered acceptable for the corresponding XML element. This section describes the business rules of the ECF operations, identifiers and messages. An MDE (typically, a Filing Assembly MDE) MAY obtain a court’s machine-readable court policy by invoking a specific court’s Court Policy MDE GetPolicy operation with the identifier for the court. When invoked, a requester MAY OPTIONALLY request case type-specific court policy information for a single specific case type by providing a valid case type value in the ecf:CaseTypeCode element. If the request includes the ecf:CaseTypeCode element, the Court Policy MDE MAY filter machine-readable court policy to that which is appropriate for a specific case type. The Court Policy MDE returns the machine-readable court policy in a synchronous response. The contents of machine-readable court policy is described in Machine-Readable Court Policy. This step MAY be omitted if the requesting MDE already has the current court policy. If this operation is enabled by court policy, a Filing Assembly MDE MAY obtain a court’s service information for all parties and other participants in an existing case at any time by invoking the GetServiceInformation operation with the appropriate case number on the Court Record MDE for the appropriate court. The service list returned by the GetServiceInformation operation assists the filer in maintaining the filer’s service list and is not a substitute for the filer’s service list. To provide this information, the Court Record MDE MUST have access to the court’s registry with all updated information about case participants. There MUST be only one such registry per court, though multiple courts MAY share the same registry. The Court Record MDE responds synchronously to the Filing Assembly MDE with a service list reflecting the most current contact information available to the court, which is necessary to complete secondary service, whether electronically or by other means. A party to a case is always the official target of service. In practice, the system MAY actually deliver to attorneys and agents as intermediaries. The duty to complete secondary service is upon the filer, and not the court, except when the court is the filer. The GetServiceInformation operation returns a service list current as of the transaction. No assumption can be made that the data returned by the operation will remain current for use at any future point in time. If this operation is enabled by court policy, a Filing Assembly MDE MAY query for the fees associated with a filing by invoking the GetFeesCalculation operation, with a filing:FilingMessage embedded within the feesrequest:GetFeesCalculationRequestMessage, on the Filing Review MDE. The Filing Review MDE responds synchronously with the fee calculation and an OPTIONAL list of the included charges. This step MAY be omitted if there are no fees associated with filings in the court or the calculated fees are already known. The GetFeesCalculation operation MAY include multiple filing:FilingMessage messages as defined in Section 6.1.4. A Filing Assembly MDE MUST submit at least one filing, as a filing:FilingMessage, to the court by invoking the ReviewFiling operation on the Filing Review MDE. The time that the message left the control of the FilingAssembly MDE MUST be provided in nc:DocumentPostDate. The date and time the filer authorized submission of the complete filing to the court MAY be provided with nc:DocumentInformationCutOffDate but this element is deprecated. The processing of a ReviewFiling operation is dependent on court policy and MAY hold the request for manual review or MAY be automated to accept the filing. The Filing Review MDE responds synchronously with a cbrn:MessageStatus that includes the filing identifier issued by the court. At the conclusion of clerk review, all filing documents which were reviewed and dispositioned during the review session, MUST have the clerk review document information and result recorded in the docket:RecordDocketingMessage and/or the reviewfilingcallback:NotifyFilingReviewCompleteMessage, using ecf:LeadDocumentReview for lead documents and ecf:ConnectedDocumentReview for connected documents. In the RecordDocketingMessage, ecf:LeadDocumentReview/ecf:Document MUST reference filing:FilingLeadDocument and ecf:ConnectedDocumentReview/ecf:Document MUST reference filing:FilingConnectedDocument if it exists. In the event a new document is added during clerk review, the new document must be included in either ecf:LeadDocumentReview (without ecf:LeadDocumentReview/ecf:Document) or ecf:ConnectedDocumentReview (without ecf:ConnectedDocumentReview/ecf:Document). The use of ecf:ReviewedDocument in RecordDocketingMessage is defined in Section 6.4.3. For documents reviewed and dispositioned during the clerk review session, the clerk review information MUST be provided using ecf:DocumentReviewStatus and an OPTIONAL ecf:DocumentReviewer. For documents and filings that have been rejected in clerk review, an explanation MUST be provided. If the clerk review session does not address all filing documents presented in each filing:FilingMessage, then those documents which have not been addressed SHOULD NOT provide ecf:ConnectedDocumentReview or ecf:LeadDocumentReview elements. If the ReviewFiling, ServeFiling or GetFeesCalculation operation included a set of multiple filing:FilingMessage messages, then all subsequent operations in the transaction, SHOULD include a corresponding set of multiple filing:FilingMessage, reviewfilingcallback:NotifyFilingReviewCompleteMessage or docketcallback:NotifyDocketingCompleteMessage messages. If RequestCourtDate is used in conjunction with and prior to ReviewFilingRequest, the tracking identifier returned by RequestCourtDate MUST be provided in the ReviewFilingRequest. At approximately the same time a Filing Assembly MDE submits the filing to the court, the Filing Assembly MDE MAY serve one or more entire filings, each as a filing:FilingMessage, to other parties in the case by invoking the ServeFiling operation on the Service MDE associated with the service recipient. This operation MUST NOT be used to serve parties in a new case or to persons or organizations that have not yet been made party to the case. The ServeFiling operation responds synchronously with cbrn:MessageStatus that acknowledges that the message will be delivered to the service recipient or with an error. The ServeFiling operation MAY include multiple filing:FilingMessage messages as defined in Section 6.1.4. If the court hosts a hub Service MDE, the Filing Assembly MDE MAY invoke the hub Service MDE’s ServeFiling operation. The hub Service MDE MUST then broadcast the message by invoking the ServeFiling operation on each individual Service MDEs and responding synchronously with a single cbrn:MessageStatus to the Filing Assembly MDE, conveying the results of each individual service transaction. If a court chooses to support electronic service, then each Filing Assembly MDE MUST support service operations for the clients for which it provides filing assembly functionality. If this operation is enabled by court policy, a Filing Assembly MDE MAY invoke this operation on a Service MDE to request service of process through electronic delivery to a process server or registered agent to parties in a new case or to persons or organizations that have not yet been made party to the case. At approximately the same time the Filing Assembly MDE submits the filing to the court, the Filing Assembly MDE MAY invoke the ServeProcess operation to request service from an organization recognized by the court for service. The Service MDE responds synchronously with an cbrn:MessageStatus that acknowledges that the filing:FilingMessage will be delivered to the service entity or with an error. The service entity MAY be an individual or an organization responsible for executing the service of process. Subsequent filing of a return of service with the court and any subsequent notifications MUST be treated as any other court filing and as such, are processed according to the Filing-Preparation-to-Docketing Process Model described above. If the court hosts a hub Service MDE, the Filing Assembly MDE MAY invoke the ServeProcess operation on the hub Service MDE. The hub Service MDE MUST then broadcast the message by invoking the ServeProcess operation on each of the individual Service MDEs and responding synchronously with a single cbrn:MessageStatus to the Filing Assembly MDE, conveying the results of each individual service transaction. If this operation is enabled by court policy, a Filing Assembly MDE MAY invoke this operation on Filing Review MDE to request cancellation of the filing but the decision to cancel the filing is the responsibility of the court. If the filing is cancelled, the reviewfilingcallback:NotifyFilingReviewCompleteMessage MUST include an ecf:FilingReviewStatusCode value of “cancelled” and MUST include the filing identifier. The authentication of requests and the impact of a cancellation on service is beyond the scope of this specification. If the clerk reviews and accepts the filing, a Filing Review MDE MUST invoke the RecordDocketing operation on the Court Record MDE for the appropriate court. The RecordDocketing operation includes information from the ReviewFiling operation with any modifications or comments by the clerk. The Court Record MDE responds synchronously with a cbrn:MessageStatus to acknowledge the request. The Court Record MDE MUST invoke the NotifyDocketingComplete operation on the Filing Review MDE that invoked a RecordDocketing operation as a callback message to indicate whether the filing was accepted or rejected by the court record system. If the Court Record MDE rejected the filing, an explanation MUST be provided. If the Court Record MDE accepts the filing, the docketing information (e.g. date and time the document was entered into the court record, judge assigned, document identifiers, nc:DocumentFileControlID, and next court event scheduled) MUST be provided. The operation MAY return the docketed documents or links to the documents. If either is returned it MUST also include the [FIPS 180-4] SHA 256 document hash. The Filing Review MDE responds synchronously with an cbrn:MessageStatus to acknowledge the callback message. If the clerk cancels or rejects a filing or a Filing Review MDE receives a NotifyDocketingComplete operation, the Filing Review MDE MUST cause the invocation of the NotifyFilingReviewComplete operation on the Filing Assembly MDE that invoked the ReviewFiling operation as a callback message to indicate whether the filing was accepted and docketed by the clerk and court record system. The operation MAY return the filed documents or links to the documents using ecf:ReviewedDocument, but MUST include the [FIPS 180-4] SHA 256 document hash, a condensed representation of a document intended to protect document integrity, and MUST NOT include ecf:Document. If a payment was processed, a receipt (i.e., payment:PaymentMessage) for the payment SHOULD be included in the operation. The Filing Assembly MDE responds synchronously with a cbrn:MessageStatus to acknowledge the callback message. If this operation is enabled by court policy, a Filing Assembly MDE MAY invoke the GetFilingList operation on a Filing Review MDE to return a list of filings matching several criteria including the filer identifier, the case number and the filed date within a certain time range. The Filing Review MDE responds synchronously with a list of matching filings and the status of each filing. If this operation is enabled by court policy, a Filing Assembly MDE MAY invoke the GetFilingStatus operation with the filing Identifier on a Filing Review MDE to return the status of the selected filing. The Filing Review MDE responds synchronously with the matching filing and the status of the filing. If this operation is enabled by court policy, a Filing Assembly MDE MAY invoke the GetCaseList operation on a Court Record MDE to return a list of cases matching several criteria including case number, case participant, or the filed date over a specific time range. The Court Record MDE responds synchronously with a list of matching cases. If this operation is enabled by court policy, a Filing Assembly MDE MAY invoke the GetCase operation with a case number on a Court Record MDE to return information about the case including the case participants, court docket and calendar events. The Filing Assembly MDE MAY also limit the amount of case detail returned from the Court Record MDE by using a set of filters. If multiple caserequest:DocketEntryTypeCodeFilter or caserequest:CourtEventTypeCode codes are provided, these should be interpreted as OR conditions. The Court Record MDE responds synchronously with the selected case information. The GetDocument operation MAY be invoked by an MDE. If this operation is enabled by court policy, then when a Filing Assembly MDE invokes the GetDocument query operation on the Court Record MDE to retrieve a particular document, the query MUST provide the document file control identifier (nc:DocumentFileControlID)and the Court Identifier (j:CaseCourt). The case number (j:CaseNumberText) and/or case tracking ID (ecf:CaseTrackingID) MAY be provided as well. The Court Record MDE will respond synchronously with the single, requested document or instructions on how to access it or a status message explaining why the document cannot be provided. If this operation is enabled by court policy, a Filing Assembly MDE MAY invoke the GetCourtSchedule operation on the Court Scheduling MDE to return the court schedule by participant, attorney or case. If this operation is enabled by court policy, a Filing Assembly MDE MAY invoke the RequestCourtDate operation on the Court Scheduling MDE to request available court dates. If this operation is enabled by court policy, a Filing Assembly MDE MAY invoke the ReserveCourtDate operation on the Court Scheduling MDE to request one or more court dates. The Court Scheduling MDE MUST return cbrn:MessageStatus to acknowledge the request. The Court Scheduling MDE MAY invoke AllocateCourtDate on the Court Record MDE to schedule the court date(s). If the initial date(s) requested are rejected, as described in the NotifyCourtDate operation below, the Filing Assembly MDE MAY invoke this operation again to request other date(s). If ReserveCourtDate is used in conjunction with and after ReviewFilingRequest, the filing identifier provided in the acknowledgement to ReviewFilingRequest, MUST be provided within the ReserveCourtDate request. A Court Scheduling MDE MUST invoke the NotifyCourtDate operation on the Filing Assembly MDE that invoked a ReserveCourtDate operation to either accept one of the dates or reject all the date(s) requested in the ReserveCourtDate operation. Dates not included in the NotifyCourtDate message SHOULD be considered rejected by the Court Scheduling MDE. A Court Record MDE MUST invoke the NotifyCourtDate operation on the Court Scheduling MDE that invoked an AllocateCourtDate operation to accept or reject the date(s) requested in the AllocateCourtDate operation. Dates not included in the NotifyCourtDate message SHOULD be considered rejected by the Court Record MDE. Identifiers are used to uniquely label people, organizations and things in the ECF 5.0 process. The following conventions will be used to produce identifiers. Court identifiers, labeled by nc:OrganizationIdentification/nc:IdentificationID, are locally assigned by the court administrator for a region (typically a state, provincial or federal court administrator) and MUST be universally unique to a court but not necessarily to a particular court house, branch or subunit of a court. Each message that includes j:CaseCourt MUST include a court identifier. These are strictly examples and do not necessarily indicate actual courts. An e-filing transaction is the set of messages associated with the operations in Figure 1. Filing and Service Process beginning with ReviewFiling and ending with ServeProcess. A filing identifier is a unique value that a FilingReviewMDE MUST assign to an e-filing transaction during the ReviewFiling operation. This same filing identifier MUST be included in all subsequent request and response messages in the e-filing transaction. · MAY include nc:IdentificationSourceText with the value “FilingReview” as defined in the MajorDesignElementTypeCode.gc code list. A message identifier is a unique value, , labeled by nc:DocumentIdentification/nc:IdentificationID, assigned to a message by the MDE that sends the message. Each message, except payment:PaymentMessage MUST have at least one message identifier. All synchronous and asynchronous response messages MUST, in addition to any message identifiers for the response message itself, include the message identifier for the original message it is responding to. · it is an immediate child element in ecf:MessageStatusAugmentation or any of the input or output messages listed in Table 1. Messages. · nc:IdentificationSourceText with the name of the MDE that assigned the message identifier (e.g. “FilingAssembly”) as defined in the MajorDesignElementTypeCode.gc code list. · nc:DocumentIdentification/nc:IdentificationID is provided for external content references to identify a document in different XML instance documents used in separate transmissions. For example, in the NotifyDocketingCompleteMessage it is necessary to communicate information about the reviewed documents. It is important and necessary that this document information can be correlated with the original filing document. This is accomplished by providing an external content reference for the filing document, then returning this external document content reference value with the reviewed documents in the NotifyDocketingCompleteMessage. · nc:DocumentFileControlID is a reference to a unique document in the Court Record system and is assigned by the Court Record MDE. The values for this element MUST be unique within a court. Please refer to Section 6.1.4 for handling document references in the RecordDocketingMessage. Documents MAY describe or reference the associated filer with nc:Document/ecf:DocumentAugmentation/nc:DocumentFiler. For elements of type nc:IdentificationType, substitutions for nc:IdentificationCategory are only allowed, when the category type element to be substituted, as identified by element name and definition, is clearly intended for the entity type for which the identification type applies. For example, the element ecf:PersonIdentificationTypeCode can substitute for nc:IdentificationCategory in nc:PersonOtherIdentification but cannot substitute for nc:IdentificationCategory within nc:DocumentIdentification. In this specification, the term ‘reference’ or ‘references’, is often used to describe a relationship or association between elements. Not all uses of the term “reference’ or “references” in this specification describe element references. Reference elements are defined and described in [NIEM NDR] section 12.2 Reference elements. Essentially, a reference element is any element that uses the structures:ref attribute. In the example in section 6.3.1, the nc:RoleOfPerson element is a reference element. When using reference elements, the rules of the [NIEM NDR] apply. Implementers should be especially aware of rules 12-2, 12-3, 12-4, 12-5 and 12-6. Reference elements SHOULD use the xsi:nil attribute set to the value “true”. Elements which have a parent to child relationship, whether that relationship is established either logically or structurally, MUST NOT participate in any element reference that contradicts the parent to child relationship. Additional non-normative guidance regarding the use of references is provided in References. Self-represented litigants that are also an attorney MAY be represented using both attorney and party elements for the same individual, with a reference from the attorney element to the party element. Otherwise, the attorney elements for a self-represented litigant SHOULD NOT include a bar number. Each operation includes one or more messages as parameters. The following business rules apply to specific 5.0 messages. A filing:FilingMessage MUST express the name or names of the party or parties on whose behalf a document is filed, and the party whose document is the subject of a responsive document being submitted for filing. Augmentations to filing:FilingMessage augmentations MUST be substituted for filing:FilingMessageAugmentationPoint and SHOULD NOT be substituted for nc:DocumentAugmentationPoint. ECF 5.0 supports multiple payment processes. Information about a payment is included in the payment:PaymentMessage including the method of payment of the applicable fees, e.g., electronic funds transfer, credit or debit card, charge to an escrow account held in the court or promise to pay in the future. The payment MAY include a maximum amount for the payment as cac:PaymentMandate/cbc:MaximumPaidAmount, if some latitude is needed to accomplish the filing. If two payment:PaymentMessages are provided in the docket:RecordDocketingMessage, then one must have payment:CorrectedPaymentIndicator set to “true” and the other must have it set to “false”, i.e., both cannot be “true” and both cannot be “false”. If a corrected payment:PaymentMessage is provided to the Court Record MDE, then it is the corrected payment:PaymentMessage that should be included in the docketcallback:NotifyDocketingCompleteMessage. The court record system SHOULD retain all complete message transmissions, including any message envelopes and headers defined by the service interaction profile, for evidentiary purposes. If the clerk added, removed or modified the original filing information or document content, then the modified information SHOULD be included in the docket:CorrectedCase, ecf:LeadDocumentReview/ecf:ReviewedDocument, ecf:ConnectedDocumentReview/ecf:ReviewedDocument, and corrected payment:PaymentMessage elements which, if used, then MUST include all information in the nc:Case, ecf:FilingLeadDocument, ecf:FilingConnectedDocument and original payment:PaymentMessage elements, respectively, with appropriate revisions, additions and deletions applied. If docket:CorrectedCase is not provided, then any modifications to case information by the clerk MUST be reflected in nc:Case. If the clerk did not modify the original filing information or document content, ecf:ReviewedDocument SHOULD reference the original document in the FilingMessage as defined in Section 6.3. A serveprocess:ServeProcessMessage is the means by which a request for service of process is sent to a service entity, which is an individual or organization having the authority to execute the service of process. It MUST specify the type of service being requested where the ecf:ServiceRecipientID value matches the participant identifier as specified in Participant Identifiers. The type of service is the physical manner in which the service of process MAY be executed. For example, the court MAY be requested to execute the service of process by means of certified mail. Alternatively, physical delivery MAY be requested from the Sheriff’s office or another legitimate process server. If the court hosts a hub Service MDE, the message MAY contain any number of service type requests for distribution by the hub. A case participant is a legal entity (person, organization and item/property) associated with a court case. The types of case participants include judicial officials, case officials (attorney), parties (litigants) and “other” entities. Each case participant MUST be represented with one of the role elements and entity representations and elaborated with the ecf:CaseParticipantRoleCode as shown in the following table. The CaseParticipantRoleCode.gc code list defines the allowed values for ecf:CaseParticipantRoleCode and includes columns indicating which code values are valid in combination with each role element. If ecf:CaseParticipantRoleCode is provided, the code value MUST be in the CaseParticipantRoleCode.gc code list and the code list column matching the role element MUST have the value “true”. Parties not represented by an attorney should be represented with ecf:CaseParty with a ecf:CasePartyRepresentationIndicator value of “true”. This section describes the process for filing and subsequently amending the Record on Appeal (ROA) using ECF 5.0. The documents that comprise the ROA transaction will be identified as supporting documents. The supporting documents that comprise the ROA transaction MAY also have additional attached documents. All ROA documents being submitted, including the Index of Record document and each document within the record, MUST have at least one court-defined document type that indicates the type of transaction to be performed on the document, and whether the document is being added to or stricken from the record. The Index of Record document and each document within the ROA transaction MAY also have an additional document type or types, which characterize the document for the Court Record MDE. When a document within the ROA transaction is being stricken from the court record, the document MUST be identified by the unique document identifier, which was provided by the Court Record MDE when the document was initially filed (See Document Identifiers). A hierarchical structure of case lineage elements MUST be used to express the target case’s predecessor cases at prior courts. Each predecessor case MAY also have its own predecessor case, as necessary to express the full lineage of an appellate case. When the ROA transaction is electronically transferred from one court to another, the target case number in the destination court and the case lineage, which includes the predecessor case number in the sending court, MUST be provided. If the ROA transaction is a case initiating filing in the destination court, then the nc:Case object MUST be present and ecf:CaseTrackingID and j:CaseNumberText MUST be absent. Each predecessor case identified in the target case’s case lineage MAY include case type and court-specific augmentations. The case type and the case type augmentations for each predecessor case MUST be consistent throughout the case lineage. While an ROA transaction is awaiting acceptance or rejection in the destination court, and when the target case consists of multiple records, courts SHOULD NOT send additional amendment transactions intended for the same record for the same target case. Individual documents within the ROA transaction MUST not be individually accepted or rejected. All documents within the ROA transaction MUST have the same acceptance or rejection disposition. hs:ChildSupportEnforcementCase MAY be included in domestic:CaseAugmentation but MUST NOT be used otherwise. An ECF 5.0 service interaction profile defines a transmission system that supports the functional requirements of electronic filing, along with the MDE operations and message structures, and implements certain non-functional requirements. A service interaction profile does not govern the content of messages – message content is described in Messages. A service interaction profile will define how a message gets from the sending MDE to the receiving MDE in a given messaging framework. Each service interaction profile will define standard conventions and configuration details to support interoperability between and among ECF 5.0 implementations that support the same service interaction profile. However, compliance with these requirements will not necessarily guarantee interoperability. The concept of “message” in the context of this section and in supporting SIPs is defined in [GRA WS-SIP] and is distinct from the concept of an ECF message as defined in other sections of this specification. 1. Transport protocol – A service interaction profile MUST define how messages are physically transported from a sending MDE to a receiving MDE. In so doing, a profile MAY identify factors that restrict the range of environments in which the profile is applicable. 2. MDE addressing – A service interaction profile MUST include a convention for uniquely addressing each MDE. 3. Operation addressing – A service interaction profile MUST describe a convention for uniquely addressing each MDE operation. 4. Request and operation invocation – A service interaction profile MUST describe a mechanism for a sending MDE to invoke an operation on the receiving MDE. 5. Synchronous mode response – A service interaction profile MUST support synchronous operations in which the response to an operation is always returned immediately, typically within a matter of seconds, to the invoking MDE. 6. Asynchronous mode response – A service interaction profile MUST support asynchronous operations in which the response to an operation MAY NOT necessarily be returned immediately to the invoking MDE. Instead, the response MAY be returned at some later time through a callback from the MDE that received the operations to the invoking MDE. The callback MUST include a reference to the invoking message transmission. 7. Message/attachment delimiters – A service interaction profile MUST define how the receiving MDE distinguishes messages from attachments within a message transmission. 8. Message identifiers – A service interaction profile MUST provide a means for a sending MDE to assign a unique identifier to each message (including any attachments) within a message transmission. 2. Message integrity – A service interaction profile SHOULD provide a mechanism so that the receiving MDE is able to determine whether the message(s) transmitted (including any attachments) was (were) modified during the message transmission. 3. Message confidentiality – A service interaction profile SHOULD provide a mechanism, such as encryption, that can be used with a sending MDE to ensure that the message(s) in a transmission (including any attachments) can be processed only by the receiving MDE. 4. Message authentication – A service interaction profile SHOULD provide a mechanism, such that a sending MDE is required to include, to display credentials that demonstrate its identity to the receiving MDE in each message transmission. 5. Message transmission reliability – A service interaction profile SHOULD provide a mechanism, such that a sending MDE is required to include, to guarantee that a message transmission will be delivered to the receiving MDE within a specified period of time, or else the sending MDE will receive notification at the end of that period of time that the message transmission was not deliverable to the receiving MDE. 7. Transmission auditing – A service interaction profile SHOULD provide a mechanism for the MDE to receive message transmissions in their entirety (both messaging and “payload” content) for auditing purposes. 1. The service interaction profile MUST be described in a document in the format of an OASIS specification. 2. The service interaction profile specification MUST identify a unique URI to identify the service interaction profile and version. 3. The service interaction profile specification MUST describe the binding of MDE operations to the service interaction profile that satisfies the functional requirements described in Processes. 4. The service interaction profile specification MUST demonstrate that the service interaction profile satisfies the non-functional service interaction profile requirements described in Service Interaction Profile Requirements. 5. The service interaction profile specification MUST include samples that demonstrate how the messaging information and “payload” content are combined into message transmissions. These samples MUST include samples that demonstrate both synchronous and asynchronous mode operations. 6. At least one voting member of the ECF TC MUST agree to sponsor the service interaction profile and submit the service interaction profile specification to the TC for review as a candidate for approval as an ECF 5.0 conformant service interaction profile. Certifying that a candidate service interaction profile meets certain service interaction profile requirements will necessarily involve some subjectivity since service interaction profile requirements cannot be expressed algebraically, in the manner of XML Schemas. Therefore, it will be up to the TC to assess whether the proposed profile’s description is adequate in meeting the requirements of ECF 5.0 before approving the service interaction profile specification as a “Committee Draft” through the OASIS standards approval process. From time to time, it MAY be necessary to revise or update a service interaction profile to bring it into compliance with changes in network and messaging protocols, or to support additional non-functional requirements. Any revision(s) to previously approved service interaction profiles will be considered a new service interaction profile and MUST meet the requirements of a new service interaction profile, including sponsorship by a voting member of the ECF TC and review and approval by the ECF TC. There will be no guarantees that future versions of a service interaction profile will be backwardly compatible with the current version. · Web Services Service Interaction Profile 2.0 Specification – This specification defines a transmission system using the specifications described in the Web Services Interoperability (WS-I) Basic Profile 1.1, W3C SOAP 1.1 Binding for MTOM 1.0, WS-I Basic Security Profile 1.0 and OASIS WS-Reliable Messaging 1.1. · Web Services Service Interaction Profile 2.1 Specification – This specification defines a transmission system using the specifications described in the Web Services Interoperability (WS-I) Basic Profile 1.1, W3C SOAP 1.1 Binding for MTOM 1.0 and WS-I Basic Security Profile 1.1 and OASIS WS-Reliable Messaging 1.1. · Portable Media Service Interaction Profile 1.01 Specification – This specification defines a transmission system in which the sending MDE stores message transmissions on portable media (e.g., a compact disc), which is then physically transported to the receiving MDE where it is connected for retrieval of the message transmissions. This specification MAY be needed in the absence of an active network between the sending and receiving MDEs. Additional service interaction profiles, or revisions to these service interaction profiles, MAY be approved by the ECF TC for use in conjunction with implementations of the ECF 5.0 specification according to the process described in Service Interaction Profile Approval And Revision Processes. An ECF 5.0 document signature profile defines a mechanism for asserting that a person signed a single electronic or imaged document, which is an attachment to a message transmission. The signing of an entire message transmission is described in a service interaction profile and is not supported by a document signature profile. Each document signature profile will define standard conventions and configuration details to support interoperability in the creation and verification of document signatures between and among ECF 5.0 implementations that support the same document signature profile. However, compliance with these requirements will not necessarily guarantee interoperability. 1. Signer name assertion – A document signature profile MUST make an assertion regarding the name of the person who signed a document. 2. Signed date assertion – A document signature profile MUST make an assertion regarding the date the person signed a document. 3. Multiple signatures – A document signature profile MUST allow multiple signatures to be associated with the same document. 2. Document integrity – A document signature profile SHOULD provide a mechanism so that the receiving MDE is able to determine if the document was modified since the person signed the document. 3. Document signature auditing – A document signature profile SHOULD provide a mechanism for the MDE to receive both the document and signatures for auditing purposes. 1. The document signature profile MUST be described in a document in the format of an OASIS specification. 2. The document signature profile specification MUST identify a unique URI to identify the document signature profile and version. 3. If the document signature is not embedded in the document, the document signature profile specification MUST include an XML structure for describing precisely how the document signature is represented. 4. The document signature profile specification MUST demonstrate that the document signature profile satisfies the non-functional requirements described in Document Signature Profile Requirements. 5. The document signature profile specification MUST include samples that demonstrate how the document signature information and “payload” content are combined into message transmissions. 6. At least one voting member of the ECF TC MUST agree to sponsor the document signature profile and submit the document signature profile specification to the TC for review as a candidate for approval as an ECF 5.0 document signature profile. Certifying that a candidate document signature profile meets certain document signature profile requirements will necessarily involve some subjectivity, since document signature profile requirements cannot be expressed algebraically, in the manner of XML Schemas. Therefore, it will be up to the TC to assess whether the proposed profile’s description is adequate to the requirements before approving the profile specification as a Committee Draft through the OASIS standards approval process. From time to time, it MAY be necessary to revise or update a document signature profile to bring it into compliance with changes in authentication and encryption protocols, or to support additional non-functional requirements. Any revision(s) to previously approved document signature profiles will be considered a new document signature profile and MUST meet the requirements of a new document signature profile, including sponsorship by a voting member of the ECF TC and review and approval by the ECF TC. There will be no guarantees that future versions of document signature profiles will be backwardly compatible with the current version. · Null Document Signature Profile 1.0 Specification – This specification defines a default mechanism to describe documents that do not have any associated signatures. · XML Document Signature Profile 1.0 Specification – This specification defines a mechanism for associating a W3C XML Signature with a document. · Application-Specific Document Signature Profile 1.0 Specification – This specification defines a mechanism for embedding an application-specific binary signature with a document. This profile supports the native capabilities in document formats such as Microsoft Word and the Adobe Portable Document Format (PDF) for describing and embedding signatures. · Proxy Document Signature Profile 1.0 Specification – This specification defines a mechanism for indicating documents that are digitally signed by a court filing infrastructure component on behalf of an authenticated signer. · Symmetric Key Document Signature Profile 1.0 Specification – This specification defines a mechanism for indicating documents that are digitally signed by a trusted entity on behalf of the signer using a symmetric key known only to the trusted entity. Additional document signature profiles, or revisions to these document signatures profiles, MAY be approved by the ECF TC for use in conjunction with implementation of the ECF 5.0 specification according to the process described in Document Signature Profile Approval and Revision Processes. An implementation conforms with the Electronic Court Filing Version 5.0 if the implementation meets the requirements in Introduction, Service Model, Information Model, and Court Policy including conformance with the XSD schemas and [Genericode] code lists referenced in Information Model and Court Policy. The ECF 5.0 specification is also published as a ZIP archive accompanying this document in the OASIS Library. Unzipping this archive creates a directory named ecf5/ containing this specification document and a number of subdirectories. The files in these subdirectories, linked to the specification document, contain the various normative and informational pieces of the 1.0 release. A description of each subdirectory is given below. ECF 5.0 UML model diagrams and spreadsheet models; see UML Models and SpreadsheetModels. XSD schemas and [Genericode] code lists; see Information Model and Court Policy. Certain components in the [NIEM] version 4.1 schemas allow recursive nesting. For example, a nc:Case can be related to another nc:Case, etc. These are legitimate business data structures. Most real-world applications will limit the depth of recursion in such structures, but XSD schemas are incapable of expressing this constraint. Implementers should be aware of this and can set limits on the depth of recursive structures in their applications. · Calendar date values should be expressed as “CCYY-MM-DD”, with a discretionary time zone qualifier designated by appending -hh:00, where hh represent the number of hours the local time zone is behind Coordinated Universal Time (UTC). · Time values should be expressed as “hh:mm:ss.sss”, with a discretionary time zone qualifier designated by appending -hh:00, where hh represent the number of hours the local time zone is behind Coordinated Universal Time (UTC). · Date and time values should be expressed as “CCYY-MM-DDThh:mm:ss.sss” with a discretionary time zone designated by appending -hh:00, where hh represent the number of hours the local time zone is behind Coordinated Universal Time (UTC).qualifier. These formats are documented in, but not enforced by, the XSD schema at schema/niem/proxy/xsd/4.0/xs.xsd. Durations are time intervals, such as an elapsed amount of time. Durations are expressed in ISO 8601 format for durations, in the form: “P[n]Y[n]M[n]DT[n]H[n]M[n]S”, where capital letters represent ‘designators’ (described below), and “[n]” represents a numeric integer value; decimal values MUST NOT be used. Although ISO 8601 also supports durations in formats “PnW” and “P<date>T<time>” these formats MUST NOT be used for durations within ECF. · P (for period) indicates a duration. This designator is required in all duration values and must be the first character. · Y identifies that the numeric value immediately preceding this designator is a number of years. · M identifies that the numeric value immediately preceding this designator is a number of months. · D identifies that the numeric value immediately preceding this designator is a number of days. · T (for time) indicates that all numeric values and designators which follow to the right are time components. · H identifies that the numeric value immediately preceding this designator is a number of hours. · M identifies that the numeric value immediately preceding this designator is a number of minutes. · S identifies that the numeric value immediately preceding this designator is a number of seconds. For example: “P4Y5M6DT7H8M9S” describes a duration of “four years, five months, six days, seven hours, eight minutes and nine seconds”. A duration “component” consists of a numeric value followed by a designator, such as “6D” for “six days”. Although the designator “P” is required, all other duration components are discretionary, provided at least one duration component is provided. The designator ‘T’ is mandatory when time components “H”, “M”, and “S” are included in the duration. The order in which duration designators appear in the duration value is normative and must appear in the sequence listed above. The duration “P1M” represents one month. The duration “PT1M” represents one minute. Durations used in ECF can typically describe an expected or actual length of a court session, such as a hearing. Typical duration values can include “PT1H” (one hour), “PT30M” (thirty minutes). However anticipated duration values for trials can be more typically “P3D” (three days) or even “P1M” (one month). This appendix describes the approach used to develop ECF 5.0 and the modeling artifacts. · Interoperability – The ECF 5.0 message structures should provide a means for exchanging court filings among all types of court information systems. · Completeness – The ECF Filing 5.0 message structures format should provide for all the elements of an electronic filing system. · Simple implementation – The design should foster rapid implementation. · Simple XML and portable structure – The core messages in an ECF 5.0 exchange will be formatted as XML documents. · Familiarity – The data elements and code values should be meaningful to the legal community and non-expert recipients alike. · Interdisciplinary and international utility – The design should be usable by a broad range of court-related applications and should be applicable internationally. The ECF 5.0 message schemas were developed as a [NIEM] Information Exchange Package Definition (IEPD) as defined by the Model Package Description [NIEM MPD] guidelines. A NIEM IEPD is a collection of artifacts that describe the structure and content of a set of data that is transmitted for a specific business purpose. Similarly, the ECF 5.0 NIEM subset and extension schemas were developed as a NIEM Business Information Exchange Components (BIEC} as defined by the [NIEM MPD] guidelines. A NIEM BIEC is a set of data components that meet a specific business need and are a part of one or more information exchanges. Neither the ECF IEPD nor the BIEC specify other interface layers (such as Web services). UML models provided in the models folder describe the use cases, components, services, interfaces, messages and data content required for ECF 5.0. The index.html file provides a starting point for navigating the models. · Providing the basis from which ECF 5.0 schemas are derived and validated. · The Model Class, Attribute, Multiplicity Columns originate from the UML class models. · The NIEM Xpath, Type, Property, Base Type and Multiplicity Columns show the mapping of the UML content to NIEM 4.1 in ECF 5.0. Properties that begin with “@” are intended to be use a reference. Properties in parentheses are representations that substitute for the first property listed in the cell. · The Old Xpath and Multiplicity columns show the mapping of the UML content to NIEM 2.01 in ECF 4.01. · The NIEM Mapping Notes column can show general information pertaining to the mapping to NIEM 4.1. · If the NIEM property refers to an element with a code list, the Code List column can list the allowable codes in that code list. The codes are separated by semicolons. Optionally, a definition can be provided for each code by appending an “=” and the definition before the semicolon. · Blue text in the NIEM Xpath and Multiplicity columns indicates differences in the NIEM mapping from ECF 4.01 to ECF 5.0. · Yellow highlighting in the NIEM Type, Property and BaseType columns indicates ECF 5.0 extensions to NIEM 4.1. The following XML fragments illustrates the typical structure for input and output messages in asynchronous and synchronous ECF 5.0 operations. The following XML fragment illustrates the typical structure for an output message to an asynchronous operation. The following XML fragment illustrates the typical structure for an input message to a synchronous operation. The following XML fragment illustrates the typical structure for an output message to a synchronous operation. Example instances of each ECF 5.0 message and case type augmentation are provided in the examples/ folder. Examples of each message are listed below. See Case type augmentation examples below. Examples of filing:FilingMessage with each case type augmentation are listed below. NIEM NDR Rule 12-2 Element with structures:ref does not have content – An element that has attribute structures:ref MUST Not have element or text content. NIEM NDR Rule 12-5 Attribute structures:ref references element of correct type – Every element that has an attribute structures:ref MUST have a referencing element type definition that is validly derived from the referenced element type definition. For example, element nc:Person could contain a structures:ref attribute that pointed to another nc:Person element or could also point to an nc:RoleOfPerson element since both nc:Person and nc:RoleOfPerson are of type nc:PersonType. NIEM NDR Rule 12-6 Reference and content elements have the same meaning – There MUST NOT be any difference in meaning between a relationship established via an element declaration instantiated as a content element and that element declaration instantiated as a reference element. In essence [NIEM NDR] rule 12-6 asserts that the meaning of ‘reference’, established using reference elements, is that ‘reference’ has the meaning “is the same as”. Added court scheduling schema and instances. Updated OASIS template. Added business rules for new messages. Clarified references and associations between lead and connected documents, parameters to GetPolicy, and identifier tags. Renamed ecf:FilingIdentification to ecf:FilingPartyID and added it to ecf:OrganizationAugmentation. Removed cbrn:MIMEContentCode which duplicated nc:BinaryFormatText. Added cac:Address. Replaced docket:CorrectedFiling with filing:FilingMessage. Fixed definition of “fiduciary”, cardinality of nc:PersonAssociation/nc:Person and identifiers in example instances. Replaced ecf:ConnectedDocument with nc:DocumentAssociation. Fixed identifiers and nc:DocumentAssociations in example instances. Added ecf:EntityItem. Added augmentation point to j:CaseCourt. Clarified requirements for court-specific code lists and use of identification categories. Renamed nc:Case to docket:CorrectedCase and made it optional in docketRecordDocketingMessage. Added ecf:CaseTypeCode to ecf:CaseAugmentation. Clarified use of case augmentations and nc:DocumentAssociation. Added sections for cancel:CancelMessage, Domestic Case Types and Element References. Added clarifications to filing:FilingMessage, docket:RecordDocketingMessage and the use of IDs/IDREFs. Added ecf:FilingAttorneyID to ecf:CaseOfficialAugmentation. Updated docket.xml. Changed ecf:PayerNameText to payment:Payer. Renamed ecf:FilingAttorneyID in ecf:CaseOfficialAugmentation to ecf:AttorneyID and clarified definition of ecf:FlingAttorneyID. Clarified reviewfilingcallback:NotifyFilingReviewComplete is the response to cancel:CancelFilingMessage. Added nc:DocumentStatus to all documents. Fixed table in Section 4.1 to include Document Stamp MDE. Updated non-normative examples. Fixed example in 6.2.1.11.1. Added new section 6.4 for Case Participant Rules and new CaseParticipantRoleCode code list. Added new Appendix F providing non-normative guidance on the use of references. Added ecf:DocumentReviewer and ecf:DocumentReviewStatus. Added TC members with voting status to Appendix A. Fixed example messages docket.xml and civil-ReviewFilingRequest-01.xml. Fixed non-example in 6.2.11.1 and clarified 4.1, 6.2.8 and 6.2.11.2. Fixed CaseParticipantRoleCode.gc. Updated the diagram in 3.2.1. Replaced references to Document Stamp MDE with Court Record MDE. Clarified scope of service in Section 2. Clarified support for “pass through” interfaces in Section 3.1. Fixed Court Scheduling sequence diagram. Clarified required and optional operations in 4.1. Relaxed requirement for payment receipts. Clarified identifiers and attorney party references in Section 6.2. Fixed formatting of table on page 42. Replaced references to RecordFiling with RecordDocketing. Relaxed constraints on FilingMessage and RecordDocketingMessage. Moved reference rules to a new section 6.3 and added a new subsection for Attorney to Party References. Renamed ecf:FiingParticipantID, ecf:AttorneyID and ecf:AttorneyID to ecf:ParticipantID and changed definition to be unique within the e-filing system. Replaced ecf:FilingParticipantID in ecf:CaseFilingType with ecf:DocumentFiler. Changed ecf:AffectedPartyID (a nc:IdentificationType) to ecf:AffectedParty (a nc:EntityType). Added cac:PaymentMandate to payment:PaymentMessage to support maximum payments. Added paymentreceipt.xml example. Changes cross-references to bookmarks. Restored example of attorney to party references in Section 6.3.1. Updated the definitions of ecf:ServiceRecipientID, ecf:ReceivingMDELocationID, ecf:ReceivingMDEProfileCode. Updated Sections 6.1.2, 6.1.9, 6.1.15, and 6.2.9. Moved and revised 6.2.6 Filing Identifiers to new 6.2.4 Message and Filing Identifiers. Revised 6.2.5 Document Identifiers. Updated UBL code lists in table in 4.3. Minor fixes to 4.3 and 5.1. Added guidance on date formats as new section B.5. Consolidated case participant role elements in 6.5. Changed cardinality of ecf:DocumentRendition/nc:Attachment and ecf:DocumentAugmentation/ecf:RegisterActionDescriptionCode. Changed cardinality of filing:FilingMessage in ReviewFilingRequestMessage and added payment:PaymentMessage to GetFeesCalculationRequestMessage. Make nc:RoleOfPerson mandatory for j:JudicialOfficial, j:EnforcementOfficial, cyfs:Juvenile, and j:Subject. Change cardinality of payment:PaymentMessage to 0,2 in RecordDocketing operation and added payment:CorrectedPaymentIndicator to payment:PaymentMessage. Update NIEM mappings to NIEM 4.0. Remove restriction that a filing:FilingMessage MAY NOT include documents for transactions such as the payment of a criminal fine. Fixed typo and clarified use of nc:DocumentFiler in Section 6.2.5. Clarified use of ecf:ReviewedConnectedDocument and ecf:ReviewedLeadDocument in 6.1.4. Added requirement for hash in 6.1.9. In Section 3.2.1, replaced references to “party” with “participant”. Replaced ecf:DocumentHash with ecf:DocumentRenditionHash. Prohibited self references and fixed indentation and reference to nc:RoleOfPerson in Section 6.3. Replaced appellate:AppellateCaseParty with ecf:CaseParty. In Section 6.2.1, clarified use of payment:CorrectedPaymentIndicator. Created ecf:ReviewedDocumentAugmentation. Added code list IdentificationSourceText.gc. Added ecf:CaseAugmentation/j:CaseNumberText and clarified in Section 6.2.2 that is a publicly recognizable case number and nc:CaseTrackingID is a unique case number. Clarified use of court-specific country codes in Section 5.2.2. First Committee Specification and 60 day Public Review Draft. Fixed wrappers.xsd. Fixed typos in 6.2.2 and 6.2.5. Removed requirement in 6.2.4 that messageID is assigned by FilingReviewMDE. Removed requirement in 6.2.2 that ecf:CaseTrackingID is assigned by CourtRecordMDE. Changed cardinality of ecf:MessageStatusAugmentationType/nc:DocumentIdentification to 1,unbounded. Changed cardinality of caserequest:GetCaseRequest/ecf:CaseTrackingID to 1,1. Added nc:IdentificationType/nc:IdentificationCategoryDescriptionText. Replaced ecf:CaseFilingType/ecf:ParticipantID with ecf:DocumentAugmentationType/ecf:DocumentFiler. Added an indicator for new cases. Removed processing directions from UML definitions (e.g. shortCaseTitle). Included enumerations and nc:IdentificationCategoryDescriptoinText in subset. Changed cardinality of ecf:CaseTrackingID to 0,1, j:CaseLineageCase to 0,unbounded and ecf:CourtEventAugmentation/ecf:ConnectedDocument to 0,unbounded. Fixed example in 6.2.2. Changed cardinality of caserequest:DocketEntryTypeCodeFilerText to 0,1, ecfCourtEventEnteredOnDocketDate to 0,1 and documentrequest:GetDocumentRequest/nc:Document to 1,1. Clarified use of nc:DocumentInformationCutOffDate in 6.1.4. Revised 6.2.4 and 6.2.5 to improve readability and clarify that the messageID provided by the sender must be returned in any related asynchronous message. Removed SelfRepresentedLitigant from CaseParticipantRoleCode.gc and added ecf:CasePartySelfRepresentationIndicator to ecf:PersonAugmentationType, ecf:OrganizationAugmentationType and ecf:ItemAugmentationType. Replaced IdentificationSourceText.gc with MajorDesignElementTypeCode.gc. Added IdentificationCategoryDescriptionText.gc. Clarified which messages must be implemented in Section 3.2.1. Replaced “episode” with “transaction” in definition of “filingID” in Section 1.1. Replaced nc:IdentificationSourceID with nc:IdentificationID and cbrn:MessageStatusAugmentation with ecf:MessageStatusAugmentation in Sections 6.2.4 and 6.2.5. Replaced ecf:CaseParticipantRoleCode with ecf:CasePartyRepresentationIndicator in Section 6.5. Added values “filingID” and “messageID” to IdentificationCategoryDescriptionText.gc. In Section 6.2.6, clarified to use ecf:ReviewedDocumentAugmentation/nc:DocumentAssociation. Revised. Changed ecf:DocumentRendition to nillable. Added ecf:LeadDocumentReview, ecf:ConnectedDocumentReview, and ecf:DocumentReviewDisposition and updated related descriptions in Sections 6.1.4, 6.2.6, and 6.4.3. Revised Section 6.2.6 to clarify requirements for filing:FilingConnectedDocument and filing:FilingLeadDocument as well as cardinality of ecf:LeadDocumentReview/ecf:Document. Upgraded NIEM to 4.1, NIEM Code List Specification 4.0 and NIEM Naming and Design Rules 4.0. Updated UBL to 2.2. Added query criteria containers documentrequest:DocumentQueryCriteria, filinglistrequest:FilingListQueryCriteria, filingstatusrequest:FilingStatusQueryCriteria caselistrequest:CaseListQueryCriteria, schedulerequest:ScheduleQueryCriteria, and policyrequest:PolicyQueryCriteria and moved query criteria parameters to the containers. Added RequestCourtDate operation with messages requestdaterequest:RequestCourtDateRequestMessage and requestdateresponse:RequestCourtDateResponseMessage. Included revisions from detailed review of message instances in a civil complaint use case including revisions to Sections 6.1.4 to deprecate nc:DocumentInformationCutOffDate; a redesign of ecf:MatchingFiling to return a ecf:CallbackMessageType (similar to docketcallback:NotifyFilingReviewComplete); schema revisions to allow all CaseAugmentation elements to be nillable; revisions to Section 6.1.9 to exclude ecf:Document from docketcallback:NotifyDocketingCoimpleteMessage and reviewfilingcallback:NotifyFilingReviewCompleteMessage; clarifications in 6.1.15, renaming ecf:FilingStatusCode to ecf:FilingReviewStatusCode; addition of ecf:FilingDocketingStatusCode, ecf:DocumentReviewStatusCode, ecf:DocumentDocketingStatusCode, ecf:DocumentTypeCode and filingrequest:FilingListQueryCriteria/nc:DocumentIdentification elements; cardinality changes to ecf:CourtEventTypeCode, caserequest:DocketEntryTypeCodeFilter, caserequest:CourtEventTypeCode, filingrequest:FilingListQueryCriteria/j:CaseNumberText and j:CaseCourtEvent/ecf:CourtEventAugmentation/ecf:CourtEventActor; replacement of nc:Document with nc:DocumentFileControlID in GetDocumentRequestMessage. Fixed typo in Section 4.3 and moved last paragraph of 6.2.9 to 6.3.1. Removed duplicate value in CaseParticipantRoleCode.gc. Changed payment:Payer to nc:EntityType. Made j:AppellateCaseNotice, nc:DocumentAssociation and ecf:DocumentAugmentation nillable. Changed cardinality of j:AppelalteCaseOriginalCase to 0,unbounded and ecf:ParticipantID to 0,1. Added non-normative examples for the appellate notice of appeal and record on appeal use cases. Change base type of requestdateresponse:RequestCourtDateResponseMessage from ecf:CaseFilingType to ecf:ResponseMessage Type. Fixed broken hyperlinks based on feedback from Paul Knight. Fixed missing court-specific code lists in Section 5.2.2. Changed cardinality of ReviewFilingRequestType/filing:FilingMessage, ServeFilingRequestType/filing:FilingMessage, ecf:RequestMessageType/filing:FilingMessage, NotifyFilingReviewCompleteRequestType/ reviewfilingcallback:NotifyFilingReviewCompleteMessage, and NotifyDocketingCompleteRequestType/ docketcallback:NotifyDocketingCompleteMessage to 1,unbounded. Clarified handling of multiple filing:FilingMessages in Section 6.1.4. Added optional PaymentMessage to GetFeesCalculation in Table 1. Reorganized Section 6.1.4 to improve readability. Replaced reference to FIPS 180-2 with FIPS 180-4 and clarified when hashes are required in Section 6.1.10. Clarified when identifiers must be provided in Section 6.2. Added references for multiple FilingMessages to Sections 6.1.3 and 6.1.5. Clarified document references in Section 6.4.1 and 6.4.3. Added reference to GRA WS-SIP in Section 7.1. Changed definitions of ecf:CaseTypeCode, ecf:CaseCategoryCode, ecf:Document, and ecf:ReviewedDocument. Updated DocumentRelatedCode.gc to remove “reviewed”. Explanation (non-normative): There is not always a one to one correspondence between a lower court case (i.e. a trial court case) and the target appellate case. A single trial court case could have multiple descendent cases, and a single appellate case can have multiple predecessors. In the situation where an appellate case has multiple predecessor cases, each predecessor case will send a record on appeal to the target court for the appellate case. Each individual record will have an independent index of record. The warning above against sending multiple ROA transactions while a prior transaction is still pending must be regarded in light of the record to which the transaction is intended (or if you prefer, the predecessor case from which it originates). For example, let’s say an appellate case has two predecessor cases, case A and case B. If an ROA transaction for the record from case A is pending (awaiting acceptance or rejection), this will not have any potential adverse impact on an ROA transaction from case B. Similarly, if a single lower court case were on appeal in two different appellate cases (say case Y and case Z), then while an ROA transaction targeted to case Y is pending, there is no potential adverse impact to case Z receiving an ROA transaction (assuming of course that case Z does not also have a pending ROA transaction from the same predecessor case). While an ROA transaction is awaiting acceptance or rejection in the destination court, courts are cautioned against, but not prohibited from, sending additional amendment transactions for the same record in the same target case, regardless of whether the case contains one or many records.